"Turkey believes that safety starts not at its borders but from beyond its border," Turkish President Recep Tayyip Erdogan said in a speech on Monday. "It is not possible to be safe without being powerful." He was referring to a "safe zone" concept that has been proposed for northern Syria in an area the US hopes to withdraw from soon. But US Secretary of State Mike Pompeo says that the safe zone should make sure that US partners in eastern Syria are not attacked by Turkey, while also ensuring Turkey is not attacked by terrorists. The latest dispute is part of tensions between Turkey and the US that have grown over the last several years. Turkey has claimed that the US is working with "terrorists" in eastern Syria because it accuses the People's Protection Units (YPG) of being linked to the Kurdistan Workers Party (PKK), while the US has been working with the Syrian Democratic Forces (SDF) to defeat ISIS and the YPG, which is part of the SDF. For Ankara, the threat of ISIS and the YPG in Syria is seen as the same, whereas US officials tend to argue that only parts of the YPG, particularly its political wing called the PYD, are linked to the PKK. In mid-December, Ankara asserted that ISIS was defeated and that Turkey would launch an operation in eastern Syria to secure the border against becoming a "terrorist corridor." It wanted to build on Operations Euphrates Shield and Olive Branch in other parts of northern Syria that had targeted ISIS and the YPG. After a phone call between US President Donald Trump and Erdogan, Trump decided to withdraw US forces from Syria. He announced the withdrawal on December 19 and indicated it would be coordinated with Turkey. But US officials, such as anti-ISIS envoy Brett McGurk were surprised. They argued that Turkey had not played a consistent role in the Syrian conflict and had let extremists cross Turkey into Syria. They supported sticking by US partners in eastern Syria who had defeated ISIS. US Senator Lindsey Graham said the US must not abandon Kurdish allies in Syria. Pompeo suggested that Turkey would "slaughter" the Kurds. Turkey was outraged, claiming that the YPG does not represent all Kurds and that Turkey has treated its Kurdish minority well and that it could do the same in eastern Syria. But Kurdish voices – including many who oppose the YPG – tended to wonder that, if this was the case, then why hadn't Ankara included more Kurds in its role in Afrin after defeating the YPG there in March 2018? Instead, Afrin has become lawless and many Kurds have fled, while Syrian Arab rebel groups have moved in. THIS HAS set up a new crisis between Washington and Ankara. Pompeo called Turkish Foreign Minister Mevlut Cavusoglu on January 21. They discussed US-Turkish "engagement" and the coordinated US withdrawal. "Pompeo reiterated the commitment of the US to addressing Turkish security concerns along the Turkish-Syrian border." However, the US was also committed to protecting the "forces that worked with the US and global coalition to defeat ISIS," Pompeo said. The Cavusoglu-Pompeo discussion shows that Turkey and the US are not on the same page. But it is not clear how much the US State Department, Pentagon and White House are on the same page. Trump and Erdogan have also held two phone calls recently. Turkish media emphasizes that the US is changing its view of the YPG. "The US is clearly changing its position on supporting terrorist groups," Daily Sabah notes. Meanwhile, Graham – who has been outspoken about standing by the Kurds in eastern Syria – traveled to Turkey and blamed the Obama administration for creating a "nightmare" there by arming Kurds in Syria and working with the YPG. This seemed to be a reversal of previous statements. At issue now is a safe zone along the border – and what "safe zone" means. Trump mentioned a "20-mile safe zone" in a January 14 tweet. The US president sees the relationship with Turkey as transactional and has discussed trade increases with Erdogan. Clearly, Turkey can offer the US more trade than eastern Syria, which Trump has characterized as "death and sand." SENSING THAT Trump is closer to Ankara's view than the State Department or the Pentagon, Erdogan said that the safe zone along the border must not become "another swamp" against Turkey. The aim of the buffer zone would be to keep terrorists away. Turkey will discuss the concept in Russia this week, with hopes that Moscow might broker a deal as the US withdraws. This is what Russia did in Idlib, brokering a deal which prevented a Syrian-regime offensive. Turkey says it wants to play a role in Manbij and other areas along the border. 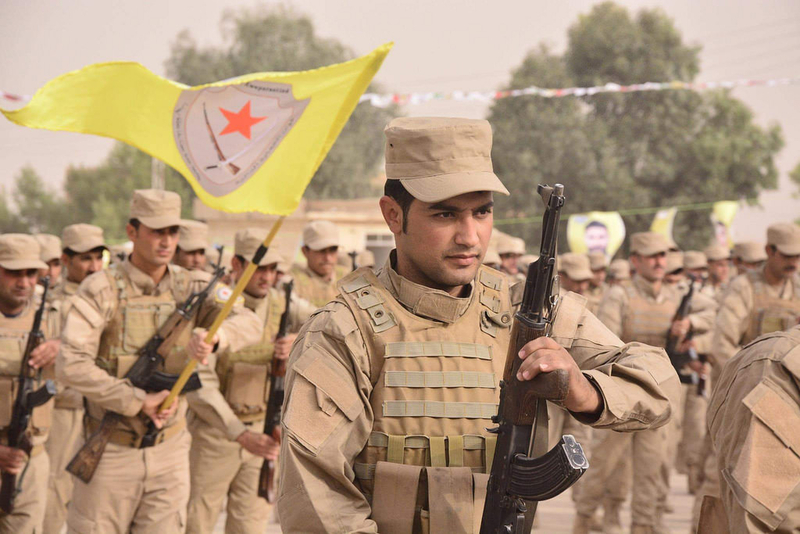 The US still appears to be juggling several agendas in Syria and has not come to an understanding with Ankara about how the withdrawal will take place without sparking a new conflict between the YPG and Turkey over the border area. There are no real proposals in the works between Turkey and the US about a border force that might patrol this "safe zone." Despite rumors that a mixed Arab "tribal" force or Kurdish Peshmerga forces connected to the Kurdistan Regional Government in Iraq might play a role, none of these are realistic proposals. None of them have strong backing from regional powers, the US or Turkey. In addition, rumors that the SDF is negotiating with the Syrian regime for autonomy and incorporating its forces into the regime to become a border force appear to be a plan only in its infancy, and one that will be out-matched by major power politics, such as the kind unfolding in Moscow. Washington's interlocutors also appear to send mixed messages to Ankara and to Syrian partners in eastern Syria, setting the stage for yet more controversy.